April 29th, 2006, is the day that lives in infamy in the Pokémon fandom. 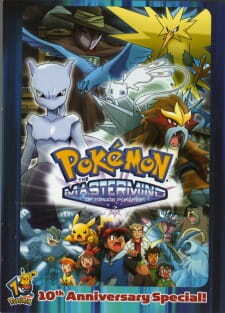 Kids' WB's promo(s) and the official Pokémon website hyped the “Mastermind of Mirage Pokémon” special up for the 10th anniversary, showing fan favorites such as Misty, Mewtwo, Entei, and Mew, and it was specially created for the fans—so much so, it was first aired overseas months before Japan got to see it. It was the first of its kind. But they were careful not to have actual audio playing from the special itself. Ten years may have passed since it was first released, however, the controversy is still felt among Pokémon fans to this very day, despite the fact the officially-available dub is what features the current cast, not the place-holders in the original. (The special was Sarah Natochenny's first time voicing Ash before she premiered in Battle Frontier, but she also got her share of negativity at the time.) Upon rewatch years after the scars have healed over, there's more to the special that deserves criticism than the voice actors who were just paid to read off the script. The special has a message that all life has purpose in the world, regardless if they're natural or mirage, and thus aren't “defects”. If this sounds familiar, that's because it is. The special takes cues from “Mewtwo Strikes Back”, which is funny because a mirage Mewtwo was exactly what the mastermind was looking for. But how'd he get this information? From Pikachu's memories. But wait a minute, didn't Mewtwo erase those memories? He did, supposedly. Was there stock footage from the movie? Not the first one (because again, Mewtwo “erased” those memories), but from “Pokémon 2000” to “Heroes”, yes, and it's possible he saw memories up to the then-latest “Lucario and the Mystery of Mew”. Wasn't there stock footage of “Mewtwo Returns”, though? No, because TV specials don't count in a TV special. Maybe that's where he got the information from, but the special waves that away, so we don't get an explicit answer as to how he learned about Mewtwo. If it was to keep it a “plot twist”, unfortunately, that was its biggest selling point, so it probably would've been better to show “memory” footage of Mewtwo. But that's just one of many problems in this 40-minute special when you start using your brain. Not surprising that a Pokémon special can't battle its way out of a narrative paper bag. This is fan-pandering at its finest, seven years before “Pokémon Origins” came to trump it (which was later then usurped by “Hoopa and the Clash of Ages”, but whatever). CHARACTERS: What can be said that hasn't already been said? Ash is Ash. May is May. Brock is Brock (though he's missing from the majority of the special anyway). Team Rocket is Team Rocket. Even Misty is Misty, except it's like she didn't change from Johto minus Togepi and it was the last time she appeared in the anime—what a send off. I'd talk about Dr. Yung, except it's unfortunate he got kidnapped like five minutes after his introduction because there's not much to talk about. The trope “walking spoiler” perfectly describes his character, which is arguably the worst thing about this special next to... everything else since the special wasn't long enough to develop him. I'm sure you can figure out why I'm beating around the bush here, it was... kind of obvious from the beginning of the special. I'm not even going to bother bringing up the “stars” Mewtwo and Mew because they're basically different characters from their first movie counterparts. Well... Mew is probably justifiable since there's multiple Mew anyway, and it's the cutest, maybe most sympathetic character of the special (if you can get past its squeaky Kirby-esque voice and weird-looking design), but it doesn't live up to its status as a Mew. Funny thing, though, that this Mewtwo is a better Mewtwo than the one in “Genesect and the Legend Awakened”. But that's not saying much. ART/ANIMATION: It's standard animation from the TV series and Chronicles, there's nothing about it that really stands out from the norm even during the climatic battle (not even the Mewtwo v. Mew battle). But the CGI that was used is awkward and stilted even for the time, making it up-to-par with the CGI used in “Pokémon 4Ever”. This is where Mewtwo comes in. He channels his inner Vash the Stampede and forms mutant Pokémon heads from his arms for various attacks such as Hyper Beam being shot from a Rayquaza head. And this makes him the “ultimate Pokémon” simply because Mewtwo has the genes of a Mew and thus CAN theoretically use every single attack. But I doubt the masked man was aware of that, he just cared about making this abomination to flaunt around for some reason. SOUND: This is all everyone remembers of this special, so there's no point in beating a dead horse longer than needed. But I might as well bring up that “Mastermind of Mirage Pokémon” is the only thing Pokémon-related that has two English dubs by PUSA: the infamous “testing ground” dub, and the newer dub that's available on the “Lucario and Mystery of Mew” DVD, and is the one I'm going off of. If I had dared to be stupid and risked killing my VCR, I'd have put in my decade-old VHS tape of the special to try and relive my ruined childhood. But I chose not to. Considering even the Internet wants to forget, I couldn't find the original dub for comparison, so it's my fault for chickening out. Not that it matters, as Kayzie Rogers' portrayal of Ash is the equivalent of nails on a chalkboard made of obsidian if memory serves correctly. The soundtrack is from the anime, but it's not dub-created. One notable moment was the original Japanese soundtrack of “Mewtwo Strikes Back” being used to nice effect in the climax. So at the very least, for that reason, it's probably one of the better-handled musical scores for a Pokémon dub. They don't cram in music for every single second of the special, and they allowed at least one dramatic scene to be silent for effect, which is kind of a rarity. I can't say if this continued on for the TPCi dubs of the television series and movies, but here, I can give them credit where it's due. ENJOYMENT/OVERALL: Even though I've been a fan since 1999, “Mastermind” is a hard sit more-often than not. It has little to do with the dub, nor the obvious fan-pandering (as it does feel like the special was made with international fans in mind), it's for the unoriginality. Pokémon isn't original, but it has a way to be entertaining and refreshing in ideas. It's not original to fall back on popular, nostalgic ideas for cheap views, it only hurts it even if it's not noticeable at first. Although before it could make its callbacks, the damage was done the moment Ash opened his mouth in the beginning scene of the television broadcast. But even if that wasn't the case, and Veronica Taylor, Eric Stuart, Rachael Lillis, Maddie Blaustein, Stuart Zagnit and even Amy Birnbaum as Max were still their characters, the problems would've slowly been made more prominent as the fans grew up. This is perhaps the only time in the history of dubbing that voice-acting killed a project before it even got out of the gate and forever soiled it for proper unbiased reviewing. I'm not sure if I should be impressed or disheartened by this, albeit I am embarrassed I had sent a letter to 4KIDS in response to the special, whether they read my terrible (and possibly ignorant) ramblings or not. This special's more for the dedicated fan than the casual, but also is one of the ones where you need to let go of the bias of ten years ago. Newer fans luckily don't have to go through with this (count your lucky stars, young'uns), it's just the older ones who will need to in order to rewatch it. But it's not really worth it, not when all the worst of the writing incompetencies come crashing together into a single mess of a special.